Multipurpose knife has a scalloped or serrated edge and comes in several sizes; the most helpful one has a blade that is at least 7 to 8 inches long. It may be called a Bread Knife, Slicer or carver, and its uses include slicing bread, cakes, tomatoes, cooked meats and carving a turkey. 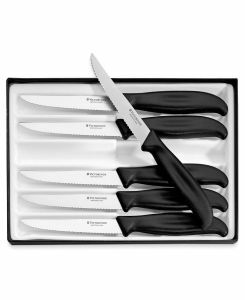 Also See Clam Knife, Parmesan Knife, Utility Knife, Turning Knife, Santoku Knife, Serrated Cake Knife.